Now that I have a nice shiny new floor, it's time to put the wall covering up. So last Thursday Robin and Beth from the Perfect Touch came in and worked their magic. Why is it old houses all have those slanty ceilings upstairs? There is no way I could have done this! 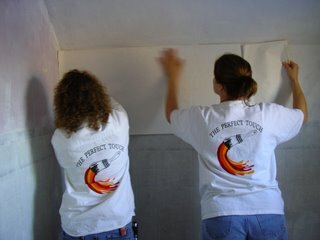 When they finished I had beautiful "new" walls. All I had left to do is paint. Piece of cake, right? Friday afternoon I painted the woodwork figuring I'd have all day on Saturday to paint the ceiling and the walls. 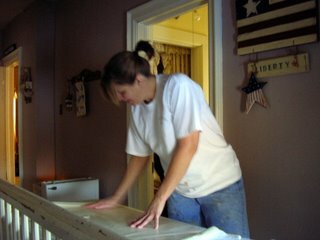 I love our painted Italiante woodwork - I just hate painting it. I need a ladder to reach the top and I'm on my knees for the bottom. It's hard on my old body and I was aching and tired when I finished. I was actually looking forward to painting the walls. Saturday morning bright and early I was up spackling and taping off in preparation for painting the ceiling. I decided to re-prime the ceiling as I was painting it an off-white over that deep pink and knew that I was going to have to put two coats on to cover it. After fillng my rolling pan full of oil based primer I put it on the ladder and moved the ladder into position - rather I started to move the ladder - when the entire pan full of paint fell upside down on my new floor! I stared in horror at the mess. Sure, I had layers of papers on the floor, but when I tried to roll up the papers to get the ones full of paint off the floor, a huge puddle of paint spilled out ON to my floor! Now I was truly in a panic. I don't normally use oil-based paints and I had nothing to clean it up with. I mopped up most of it with rags and ran to the lumber yard for something to use to clean up my mess. Charlene sent me home with mineral spirits and that seemed to do the trick. However I won't truly know if I've done any damage until I remove all of the papers when I'm done and see what is underneath. I was devastated - we just had that laid on Wednesday and it wasn't even paid for, now I've done this! After (shakily) finishing the ceiling it was time to start on the walls. 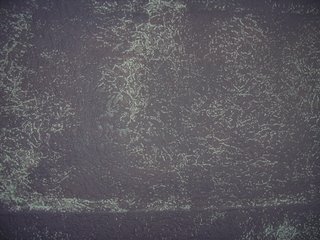 I taped off the ceiling and woodwork and (carefully) put my rolling pan on my ladder and started on the walls only to discover that the roller I had wasn't the right one to use on my deeply textured wall covering. What should have taken me one day and one gallon of paint is now taking me a day and a half and two gallons of paint. Why does this not surprise me. 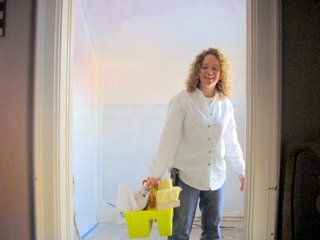 I spent all day yesterday, with a brush, painting the walls. (I kept thinking of Karate Kid - "Show me 'paint the fence' ") Today I'm going to the lumberyard and getting the correct roller and another gallon of paint to give the walls the second coat of paint. That color is a deep plum - I call it eggplant - and it is going to be beautiful. It's darker than the little paint sample card but I'm really liking it (thank God!). Tuesday Tom will be replacing the tub and stool into the room and I'll be finished. I hope. My "little" project will finally be finished. 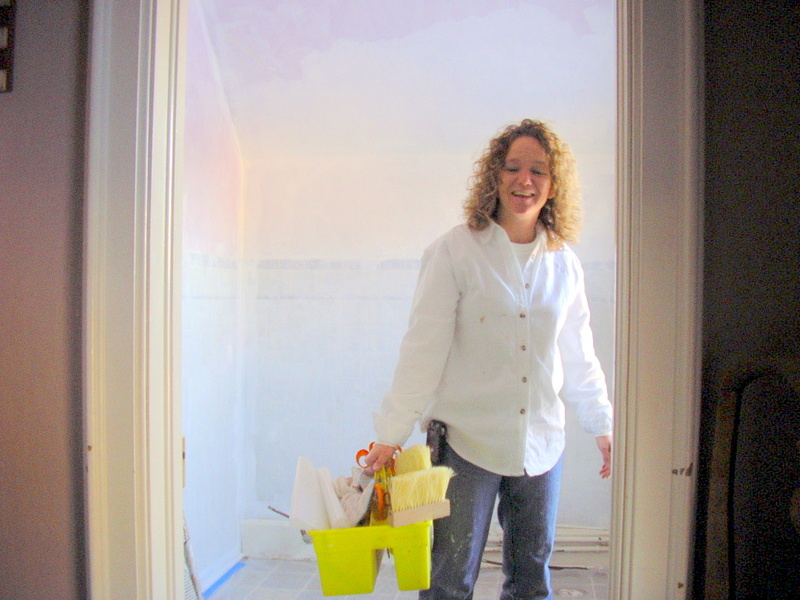 There are no "little" improvement projects around the home. I am so sorry about the spilled paint. I know how that goes, been there done that. Yesterday I put the first coat of finish on the new drawer fronts in the kitchen. It never seems to end. I thought you were done with the kitchen? And, no, old houses always yield up surprises. Keep up the good work! I'll be painting my kitchen walls and cabinets in the next few months, so I'll have to remember the spilled-paint-on-the-floor incident. How awful. Thanks Tammy. You have no idea. This has been the bathroom from hell!!! Good luck with your remodel. Thanks for visiting.